We show evidence that a tail factor extracted from the option market predicts future market returns in both US and many of the european markets. Most importantly this factor is embedded in the dynamics of option prices but not in the time series of stock prices, showing the importance of the derivatives market in embedding beliefs about possible future market downturns. The paper explores the global pricing of market tail risk as manifest in equity-index options. We document the presence of a left tail factor that displays large persistent shifts, largely unrelated to the corresponding dynamics of return volatility. This left tail factor is a potent predictor of future excess equity-index returns, while the implied volatility only forecasts future equity return variation, not the expected returns. We conclude that the option surface embeds separate equity risk and risk premium factors which are successfully disentangled by our simple two-factor affine model for all the equity indices explored. The systematic deviations across countries speak to the differential risk and its pricing during the great recession and the European sovereign debt crises. Most strikingly, the relative tail risk pricing displays pronounced heterogeneity for the Southern European countries. During the sovereign debt crisis, their stock markets react almost identically to Euro-wide systematic shock, but these events are priced very differently in the respective option markets, indicating differences in crash beliefs across countries which are hard to detect with stock market data alone. We provide a new estimator for the parameter vector and the latent stat variables of an option pricing models governed by a pure jump process. The estimator takes the form of a penalized least square where the penalization term takes into account for both jump intensity and jump activity index estimated from high-frequency data. We develop parametric inference procedures for large panels of noisy option data in a setting, where the underlying process is of pure-jump type, i.e., evolves only through a sequence of jumps. The panel consists of options written on the underlying asset with a (different) set of strikes and ma- turities available across the observation times. We consider an asymptotic setting in which the cross-sectional dimension of the panel increases to infinity, while the time span remains fixed. The information set is augmented with high-frequency data on the underlying asset. Given a parametric specification for the risk-neutral asset return dynamics, the option prices are nonlinear functions of a time-invariant parameter vector and a time-varying latent state vector (or factors). Further- more, no-arbitrage restrictions impose a direct link between some of the quantities that may be identified from the return and option data. These include the so-called jump activity index as well as the time-varying jump intensity. We propose penalized least squares estimation in which we minimize the L2 distance between observed and model-implied options. In addition, we penalize for the deviation of the model-implied quantities from their model-free counterparts, obtained from the high-frequency returns. We derive the joint asymptotic distribution of the parameters, factor realizations and high-frequency measures, which is mixed Gaussian. The different components of the parameter and state vector exhibit different rates of convergence, depending on the relative (asymptotic) informativeness of the high-frequency return data and the option panel. We propose a unified estimator for the parameter vector and the latent state variables of a non linear factor model governing the dynamics of panel observations. Relying on fill-in asymptotic the estimator can simultaneously accomodate the case in which the time span is fixed or large. We provide unifying inference theory for parametric nonlinear factor models based on a panel of noisy observations. The panel has a large cross-section and a time span that may be either small or large. Moreover, we incorporate an additional source of information, provided by noisy observations on some known functions of the factor realizations. The estimation is carried out via penalized least squares, i.e., by minimizing the L2 distance between observations from the panel and their model-implied counterparts, augmented by a penalty for the deviation of the extracted factors from the noisy signals of them. When the time dimension is fixed, the limit distribution of the parameter vector is mixed Gaussian with conditional variance depending on the path of the factor realizations. On the other hand, when the time span is large, the convergence rate is faster and the limit distribution is Gaussian with a constant variance. In this case, however, we incur an incidental parameter problem since, at each point in time, we need to recover the concurrent factor realizations. This leads to an asymptotic bias that is absent in the setting with a fixed time span. In either scenario, the limit distribution of the estimates for the factor realizations is mixed Gaussian, but is related to the limiting distribution of the parameter vector only in the scenario with a fixed time horizon. Although the limit behavior is very different for the small versus large time span, we develop a feasible inference theory that applies, without modification, in either case. Hence, the user need not take a stand on the relative size of the time dimension of the panel. Similarly, we propose a time-varying data-driven weighting of the penalty in the objective function, which enhances efficiency by adapting to the relative quality of the signal for the factor realizations. Using options with very short maturity we study the dynamics of the variance and jump risks. We find that the shape of the left tail of the risk-neutral distribution (1) shows persistent changes over time which are not always connected to the dynamics of volatility and (2) that it has predictive power for future short-term market returns. We study short-term market risks implied by weekly S&P 500 index options. The introduction of weekly options has dramatically shifted the maturity profile of traded options over the last five years, with a substantial proportion now having expiry within one week. Such short-dated options provide a direct way to study volatility and jump risks. Unlike longer-dated options, they are largely insensitive to the risk of intertemporal shifts in the economic environment. Adopting a novel semi-nonparametric approach, we uncover variation in the negative jump tail risk which is not spanned by market volatility and helps predict future equity returns. Incidents of tail shape shifts coincide with mispricing of standard parametric models for longer-dated options. As such, our approach allows for easy identification of periods of heightened concerns about negative tail events that are not always “signaled” by the level of market volatility and elude standard asset pricing models. The dynamics of the out-of-the-money Put options is not only driven by volatility but also by a factor that is independent from it. This factor has predictive power for future risk premia (i.e. equity and variance risk premia) but not for future risks (i.e. future volatility and future jumps). 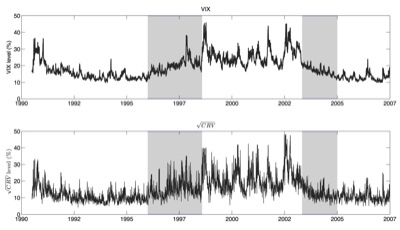 We study the dynamic relation between market risks and risk premia using time series of index option surfaces. We find that priced left tail risk cannot be spanned by market volatility (and its components) and introduce a new tail factor. This tail factor has no incremental predictive power for future volatility and jump risks, beyond current and past volatility, but is critical in predicting future market equity and variance risk premia. Our findings suggest a wide wedge between the dynamics of market risks and their compensation, with the latter typically displaying a far more persistent reaction following market crises. We develop a new estimation procedure to estimate option pricing models that relies on the assumption that the number of options on a given day goes to infinity. We also provide three different tests to assess the empirical performance of a given option pricing model. 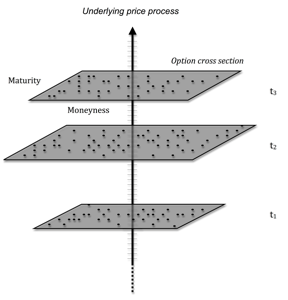 We develop a new parametric estimation procedure for option panels observed with error which relies on asymptotic approximations assuming an ever increasing set of observed option prices in the moneyness-maturity (cross-sectional) dimension, but with a fixed time span. We develop consistent estimators of the parameter vector and the dynamic realization of the state vector that governs the option price dynamics. The estimators converge stably to a mixed-Gaussian law and we develop feasible estimators for the limiting variance. We provide semiparametric tests for the option price dynamics based on the distance between the spot volatility extracted from the options and the one obtained nonparametrically from high-frequency data on the underlying asset. We further construct new formal tests of the model fit for specific regions of the volatility surface and for the stability of the risk-neutral dynamics over a given period of time. We develop a model in which the Realized Volatility can be used as an input to price option. The advantage, with respect to traditional GARCH models, is that the model is more reactive to changes in volatility and thus produces more accurate pricing for at-the-money short maturity options. Also, the persistence built in our model allows to better capture the term structure of the implied volatility surface. We develop a discrete-time stochastic volatility option pricing model, which exploits the information contained in high frequency data. 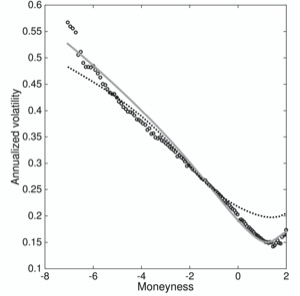 The Realized Volatility (RV) is used as a proxy of the unobservable log-returns volatility. We model its dynamics by a simple but effective long-memory process: The Leverage Heterogeneous Auto-Regressive Gamma (HARGL) process. The discrete-time specification and the use of the RV allow to easily estimate the model using observed historical data. Assuming a standard exponentially affine stochastic discount factor, we obtain a fully analytic change of measure. An extensive empirical analysis of S&P 500 index options illustrates that our approach significantly outperforms competing time-varying (i.e. GARCH-type) and stochastic volatility pricing models. The pricing improvement can be ascribed to: (i) The direct use of the RV, which provides a precise and fast adapting measure of the unobserved underlying volatility; (ii) The specification of our model, which is able to accurately reproduce the implied volatility term structure. Within the real option framework we provide a quantitative approach to evaluate modular projects. We provide a general valuation approach for capital budgeting decisions involving the modularization in the design of a system. Within the framework developed by Baldwin and Clark (2000), we implement a valuation approach using a numerical procedure based on the Least Squares Monte Carlo method proposed by Longstaff and Schwartz (2001). The approach is accurate, general and flexible. Correcting the transition probabilities of a standard binomial (trinomial) model to take into account for the probability of crossing a barrier between the tree steps, we improve the pricing of barrier options for many different type of barrier shapes. 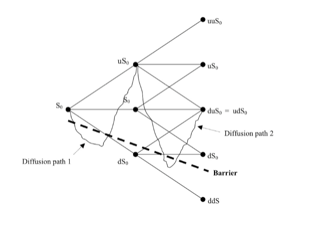 In the existing literature on barrier options much effort has been exerted to ensure convergence through placing the barrier in close proximity to, or directly onto, the nodes of the tree lattice. For a variety of barrier option types we show that such a procedure may not be a necessary prerequisite to achieving accurate option price approximations. Using the Kamrad and Ritchken (1991) trinomial tree model we show that with a suitable transition probability adjustment our “probability adjusted” model exhibits convergence to the barrier option price. We study the convergence properties of several option types including exponential barrier options, single linear time-varying barrier options, double linear time- varying barriers options and Bermuda options. For options whose strike price is close to the barrier we are able to obtain numerical results where other models and techniques typically fail. Furthermore, we show that it is possible to calculate accurate option price approximations with minimal effort for options with complicated barriers that defeat standard techniques. 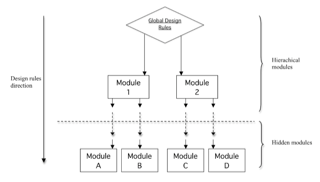 In no single case does our method require a repositioning of the pricing lattice nodes.